Proliferating cells often have increased glucose consumption and lactate excretion relative to the same cells in the quiescent state, a phenomenon known as the Warburg effect. 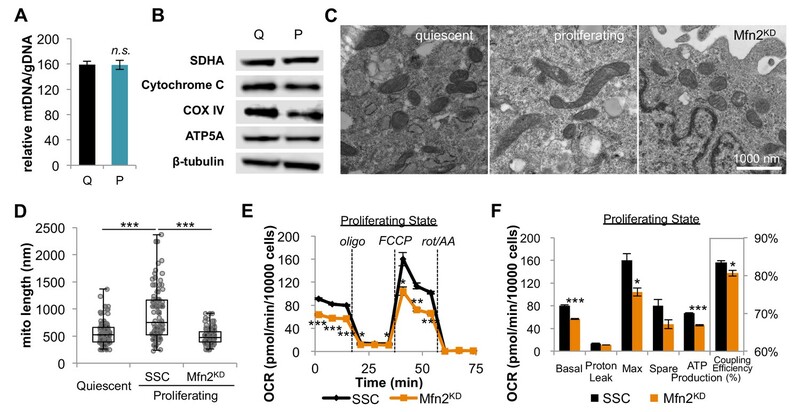 Despite an increase in glycolysis, however, here we show that non-transformed mouse fibroblasts also increase oxidative phosphorylation (OXPHOS) by nearly two-fold and mitochondrial coupling efficiency by ~30% during proliferation. Both increases are supported by mitochondrial fusion. Impairing mitochondrial fusion by knocking down mitofusion-2 (Mfn2) was sufficient to attenuate proliferation, while overexpressing Mfn2 increased proliferation. Interestingly, impairing mitochondrial fusion decreased OXPHOS but did not deplete ATP levels. Instead, inhibition caused cells to transition from excreting aspartate to consuming it. Transforming fibroblasts with the Ras oncogene induced mitochondrial biogenesis, which further elevated OXPHOS. Notably, transformed fibroblasts continued to have elongated mitochondria and their proliferation remained sensitive to inhibition of Mfn2. Our results suggest that cell proliferation requires increased OXPHOS as supported by mitochondrial fusion. Most cells in the body contain many small compartments called mitochondria. These tiny powerhouses can use oxygen to break down molecules of glucose (a type of sugar) and release the energy that fuels many life processes. Mitochondria can also use oxygen to build certain compounds essential for the cell. Rapidly dividing cells, such as the ones found in tumors, need a lot of energy. Yet, they often ‘choose’ to burn much of their glucose through fermentation, a less efficient process that does not require oxygen or mitochondria. In fact, many theories suggest that cells which divide a lot decrease the quantity of oxygen their mitochondria consume. It is still unclear what role mitochondria have during phases of intense growth, and if they act differently in cancerous and healthy cells. Here, Yao et al. use a cell system where division can be turned on or off, and find that when cells quickly multiply, their mitochondria actually consume more oxygen. Further experiments then reveal that, in both cancerous and healthy cells, the different mitochondria inside a cell merge during periods of intense division. This mechanism allows the compartment to better use oxygen. Yao et al. go on to show that adjusting the fusion process through genetic manipulation helps to control division. When mitochondria cannot combine, cells divide less well; when the compartments can merge more easily, cells multiply faster. If growing cells do not rely on their mitochondria for their energy demands during multiplication, why do these compartments seem to be essential for division? The reason might be that the mitochondria produce aspartate, a molecule that cells use to replicate. The work by Yao et al. suggests that at least certain cancer cells may increase their consumption of oxygen to sustain their mitochondria; armed with this knowledge, it may be possible to design new diagnostic tests and new treatments to identify, and potentially target these oxygen-dependent tumor cells. Depending on cell type and microenvironment, various adaptations in metabolism have been associated with cellular proliferation. The metabolic adaptation that has received the most attention is a phenomenon known as aerobic glycolysis or the Warburg effect, which is characterized by a high level of glucose consumption and a high rate of glucose fermentation to lactate irrespective of oxygen availability (Liberti and Locasale, 2016; Vander Heiden et al., 2009). Although the Warburg effect is recognized as a typical feature of dividing cancer cells and is the basis for imaging many tumors in the clinic with fluorodeoxyglucose positron emission tomography (Hanahan and Weinberg, 2011; Zhu et al., 2011), it is also found in normal proliferating cells such as non-transformed fibroblasts, lymphocytes, macrophages, thymocytes, endothelial cells, and embryonic stem cells (Brand, 1985; Hedeskov, 1968; Hume et al., 1978; Munyon and Merchant, 1959; Wang et al., 1976). Accordingly, even in non-cancerous contexts, the Warburg effect has been classified as a hallmark of rapid proliferation (Abdel-Haleem et al., 2017). Although there is a general consensus that glycolytic flux increases in proliferating cells, the extent to which oxidative metabolism is altered has been historically complicated (DeBerardinis et al., 2007; Seyfried, 2015). Warburg originally proposed that cancer cells rely on enhanced glycolysis because of defects in mitochondria (Warburg, 1956). Some cancers do have defective mitochondrial enzymes (e.g. succinate dehydrogenase and fumarase), but it is now well established that most proliferating cells (including cancer) have functional mitochondria (Ahn and Metallo, 2015; Vyas et al., 2016). Indeed, functional mitochondria are essential to the proliferation of some cell types. Studies have shown that oxidative phosphorylation (OXPHOS) may provide the majority of ATP during proliferation and function to support the synthesis of important molecular building blocks such as aspartate (Birsoy et al., 2015; Fan et al., 2013; Rodríguez-Enríquez et al., 2010; Sullivan et al., 2015; Zu and Guppy, 2004). Elevated levels of OXPHOS, however, may not necessarily be required to fulfill such functions. To the contrary, many reports have suggested that proliferating cells suppress mitochondrial respiration and statements that glycolysis is preferred over OXPHOS during proliferation are prevalent in the literature (Whitaker-Menezes et al., 2011). Certain cancers of the bladder, breast, and kidney are depleted of mitochondrial DNA and have decreased expression of respiratory genes (Reznik et al., 2016). Some cancer cells exhibit high levels of mitochondrial fission and have associated decreases in respiratory capacity as mediated by an imbalance of dynamin-related protein 1 (DRP1) and mitofusin-2 (Mfn2) (Chen and Chan, 2017; Rehman et al., 2012; Serasinghe et al., 2015; Xie et al., 2015). In other cases, increasing glucose oxidation by inhibiting pyruvate dehydrogenase kinase has been shown to slow the proliferation of transformed cells (Bonnet et al., 2007). A challenge of quantitating changes in OXPHOS as a function of proliferation has been the confounding experimental factors that are often associated with cancer studies. Tumors contain non-proliferating cell types that may shift the average of metabolic measurements from bulk tissues. Additionally, cancer cells from tumors often have restricted access to oxygen (Brahimi-Horn et al., 2007). Although oxygen limitation can similarly lead to an enhanced glycolytic phenotype, this metabolic program is distinct from the Warburg effect. Finally, many studies have focused on the proliferative state of cancer cells without having an appropriately matched non-proliferating comparison with the same genetic background tested under the same conditions (Zu and Guppy, 2004). In this study, to directly compare oxidative metabolism in the same cells of the quiescent and proliferative state, we exploited the cell-density-dependent phenotype of non-transformed fibroblasts. We find that even though proliferating fibroblasts exhibit enhanced glycolysis that is consistent with a Warburg phenotype, they also increase OXPHOS by nearly two-fold and increase their mitochondrial coupling efficiency by ~30%. Interestingly, both increases are supported by mitochondrial fusion. Although transformation with the Ras oncogene further elevated OXPHOS, the additional increase was supported by mitochondrial biogenesis rather than changes in mitochondrial dynamics. Blocking mitochondrial fusion slowed proliferation in both non-transformed and transformed cells. Taken together, our results indicate that proliferation of fibroblasts requires an increase in OXPHOS supported by mitochondrial fusion. Mouse 3T3-L1 fibroblasts are immortalized, non-transformed cells that retain sensitivity to contact inhibition (Green and Kehinde, 1975). They provide a simple, well-controlled model to compare metabolism in the proliferative and quiescent states, as has been demonstrated previously (Yao et al., 2016a). The first step in our analysis was to verify that proliferating fibroblasts exhibit the Warburg effect. 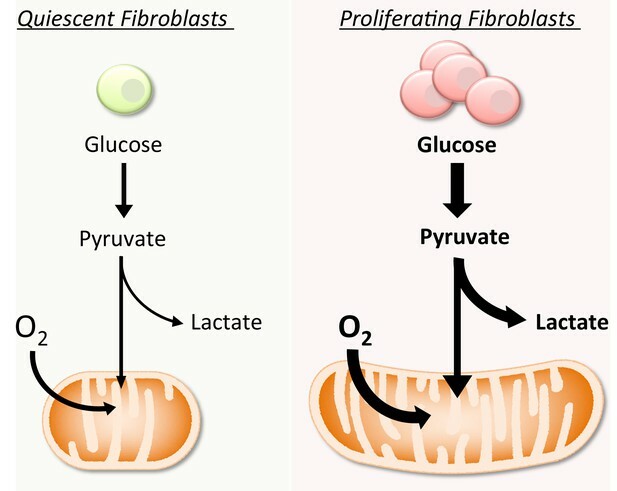 Relative to quiescent fibroblasts in the contact-inhibited state, proliferating cells had increased glucose consumption and lactate excretion (Figure 1A). As expected, proliferating cells excreted a greater percentage of glucose as lactate (47%) compared to quiescent cells (32%) (Figure 1—source data 1). Of note, the absolute amount of glucose having a non-lactate fate was also increased by over two-fold in the proliferative state (0.38 pmol/cell/hr) relative to the quiescent state (0.16 pmol/cell/hr) (Figure 1—source data 1). Glucose carbon that is not excreted as lactate is potentially available to support an increased rate of oxidative metabolism, which we next aimed to quantify. In addition to increasing glucose consumption and lactate excretion, proliferating fibroblasts also increase mitochondrial respiration and mitochondrial coupling efficiency. (A) Glucose consumption and lactate excretion rates for quiescent and proliferating fibroblasts (n = 4). As expected, proliferating cells exhibit an enhanced glycolytic phenotype that is consistent with the Warburg effect. (B) Mitochondrial stress test of quiescent and proliferating fibroblasts. OCR was normalized to protein amount to take into account differences in cell size. Displayed OCR values were corrected for non-mitochondrial respiration (n = 3). (C) Measured and calculated parameters of mitochondrial respiration (using results from Figure 1B). We note that the coupling efficiency is calculated as the ratio of the OCR required for ATP production relative to the basal OCR in the same sample and therefore is independent of the sample normalization method (n = 3). (D) Glutamine consumption and glutamate excretion rates for quiescent and proliferating fibroblasts (n = 4). (E) Palmitate and oleate consumption rates for quiescent and proliferating fibroblasts (n = 4). (F–H) Isotopologue distribution pattern of citrate after cells were labeled with U-13C glucose (F), U-13C palmitate (G), or U-13C glutamine (H) for 6 hr (n = 3). Data are presented as mean ±SEM. **p<0.01, ***p<0.001, n.s. not statistically significant. OCR, oxygen consumption rate; oligo, oligomycin; rot, rotenone; AA, Antimycin A. Strikingly, on a per cell basis, we found that the basal respiration rate was ~81% higher during proliferation compared to quiescence (Figure 1—figure supplement 1). Given that proliferating cells are larger in size relative to quiescent cells, we also independently normalized the oxygen-consumption data by protein content instead of cell number. Even when normalized by protein content, the respiration rate of proliferating cells was ~59% higher than quiescent cells (Figure 1B–C). Intriguingly, proliferating cells also exhibited a decrease in proton leak and a ~ 112% increase in ATP production (Figure 1B–C). Taken together, the coupling efficiency of proliferating cells was determined to be 34% higher than quiescent cells. We note that the coupling efficiency was calculated as the ratio of the ATP production rate and the basal respiration rate, which is therefore independent of sample normalization method. These data suggest that proliferating fibroblasts with Warburg metabolism not only have increased OXPHOS, but also that they respire more efficiently. We next aimed to investigate which carbon sources fuel mitochondrial respiration by analyzing the utilization of glucose, glutamine, and fatty acids. In addition to increasing glucose consumption and lactate excretion (Figure 1A), proliferating fibroblasts take up two-fold more glutamine compared to quiescent fibroblasts (Figure 1D). Since the rate of glutamate excretion was unchanged, more glutamine carbon was being used for anaplerosis. We also found that the consumption rates of palmitate and oleate were increased in proliferation by 194% and 98%, respectively (Figure 1E). Since proliferating fibroblasts showed increased utilization of all three nutrients we examined, we next applied stable isotope tracing and metabolomics to access the relative contribution of each carbon source to the TCA cycle. In three separate experiments, cells were fed either uniformly 13C-labeled glucose (U-13C glucose), uniformly 13C-labeled glutamine (U-13C glutamine), or uniformly 13C-labeled palmitate (U-13C palmitate) for 6 hr. The isotope enrichments in citrate, a representative TCA cycle intermediate, were evaluated to infer the relative contribution of each carbon source to the TCA cycle and mitochondrial respiration. Even though proliferating cells consumed more glucose and more fatty acids, citrate labeling from these two carbon sources was significantly decreased in the proliferative state (Figure 1F; Figure 1G). In contrast, labeling of citrate by glutamine was substantial and significantly increased in proliferating cells relative to quiescent cells, suggesting that glutamine is a major energy source to fuel mitochondrial respiration (Figure 1H). This result is consistent with reports from other cells (Fan et al., 2013). Given that previous studies have shown that glutamine dependence is correlated with cystine uptake through the cystine/glutamate antiporter SLC7A11 (Muir et al., 2017), we examined whether these metabolite changes were enabled by transporter expression. Even though the level of SLC7A11 protein was unchanged, we observed more than a two-fold increase in cystine comsumption for proliferating fibroblasts compared to quiescent fibroblasts (Figure 1—figure supplement 2). Increased influx of cystine may drive the export of glutamate, thereby depleting the pool of intracellular glutamate/αKG and promoting glutamine anaplerosis (Muir et al., 2017). We next sought to understand how fibroblasts support increased OXPHOS during proliferation. We reasoned that one mechanism might be by increasing mitochondrial mass in the proliferative state. We used RT-PCR to determine the relative copy number of mitochondrial DNA (mtDNA) to genomic DNA (gDNA), from which we inferred mitochondrial mass. The mtDNA to gDNA ratio was unchanged between quiescent and proliferating cells (Figure 2A). Consistent with these data, we also observed no change in expression of respiratory enzymes, as determined by immunoblotting of electron transport chain (ETC) subunits (SDHA for complex II, cytochrome c for complex III, COX IV for complex IV, and ATP5A for complex V) (Figure 2B). Our results indicate that proliferating fibroblasts do not support elevated levels of OXPHOS by increasing mitochondrial mass or by increasing the expression of respiratory enzymes. Proliferating fibroblasts regulate respiration by mitochondrial fusion. (A) Mitochondrial mass remains the same for quiescent (Q) and proliferating (P) fibroblasts as estimated by the ratio of mtDNA to gDNA (n = 3). (B) Proliferating fibroblasts have similar protein expression levels of ETC subunits as quiescent fibroblasts. (C) Representative EM images of mitochondria in quiescent fibroblasts, proliferating fibroblasts, and proliferating Mfn2 knockdowns show changes in mitochondrial elongation. (D) Statistical analysis of mitochondrial length in quiescent fibroblasts, proliferating fibroblasts, and proliferating Mfn2 knockdowns. For each condition, 100 random mitochondria were measured from EM images. Data are presented as mean ±SD. (E) Mitochondrial stress test of scrambled siRNA control (SSC) cells and Mfn2 knockdown cells (Mfn2KD), both in the proliferating state (n = 3). Data are presented as mean ±SEM. (F) Measured and calculated parameters of mitochondrial respiration (using results from Figure 2E) (n = 3). Data are presented as mean ±SEM. *p<0.05, **p<0.01, ***p<0.001, n.s. not statistically significant. OCR, oxygen consumption rate; oligo, oligomycin; rot, rotenone; AA, Antimycin A. As an alternative, we then considered the possibility that fibroblasts regulate OXPHOS during proliferation by mitochondrial dynamics. Previous studies have shown that mitochondrial fusion is associated with an increased respiration rate in addition to an improved coupling efficiency (Legros et al., 2002; Westermann, 2012). To assess mitochondrial morphology, we applied electron microscopy (EM) imaging (Figure 2C) and fluorescence imaging (Figure 2—figure supplement 1). Both techniques showed that proliferating cells have elongated mitochondria, while mitochondria in quiescent cells were relatively short and fragmented. Quantitative analysis of 100 random mitochondria in each condition showed a statistically significant increase in the mitochondrial length of proliferating cells compared to quiescent cells (Figure 2D). In addition, we found that mitochondria in proliferating cells had a significantly higher level of mitochondrial fusion proteins (Mfn1, Mfn2, and OPA1) compared to mitochondria in quiescent cells (Figure 2—figure supplement 2). When we inhibited mitochondrial fusion by knocking down Mfn2, a protein required for the fusion of the outer mitochondrial membrane, the elongated mitochondrial phenotype in proliferating fibroblasts was suppressed (Figure 2C–D, Figure 2—figure supplement 3). To determine whether mitochondrial fusion is required for increased OXPHOS during proliferation, we compared the oxygen consumption rates of proliferating scrambled siRNA controls (SSC) to Mfn2 knockdowns (Mfn2KD). We point out that these comparisons were conducted when cells were in the proliferating exponential growth phase. Notably, Mfn2 knockdowns had a statistically significant decrease in respiration rate, ATP production, and mitochondrial coupling efficiency (Figure 2E–F). Given that mitochondria in quiescent fibroblasts are already largely fragmented, as expected, the effect of Mfn2 knockdown on basal mitochondrial respiration was minimal in quiescent cells (Figure 2—figure supplement 4). Independent of contact inhibition, cellular quiescence can also be achieved by serum starvation (Yao, 2014). By using serum starvation, we sought to extend our comparison of the proliferative and quiescent states to other cells. Consistent with our contact-inhibition results, we found that serum starved 3T3-L1 and HCT116 cells had fragmented mitochondria relative to the same cells in the non-starved state (Figure 2—figure supplement 5). Mitochondrial elongation occurred as soon as 3 hr after reintroducing serum and continued as cells exited the quiescent state (Figure 2—figure supplement 5B). Having established that mitochondrial fusion increased in dividing cells, we wished to consider its effects on proliferation. Upon Mfn2 knockdown, we observed a ~ 30% decrease in proliferation rate compared to scrambled siRNA controls (Figure 3A). Re-expressing siRNA-resistant Mfn2 (Mfn2res) in Mfn2 knockdowns restored Mfn2 protein level, mitochondrial respiration, and cellular proliferation (Figure 3—figure supplement 1). When we overexpressed Mfn2 in wildtype 3T3-L1 fibroblasts, we observed a significant increase in both mitochondrial respiration and proliferation (Figure 3—figure supplement 2). These data suggest that promoting mitochondrial fusion is sufficient to drive proliferation. We also observed considerable changes in nutrient utilization between Mfn2 knockdowns and scrambled siRNA controls that were consistent with decreased proliferation and reduced OXPHOS (Figure 3B). Mfn2 knockdowns decreased their glucose uptake by 15% and decreased their lactate excretion by 10%. More notably, knocking down Mfn2 caused cells to decrease glutamine consumption by 40%. Given the reduced rate of OXPHOS in Mfn2 knockdowns, these data are consistent with glutamine serving as a major carbon source for the TCA cycle. Tracing experiments confirmed a significant decrease in labeling of TCA cycle intermediates from U-13C glutamine in Mfn2 knockdowns (Figure 3—figure supplement 3A–C). Consistent with decreased glutamine anaplerosis, Mfn2 knockdowns had a 40% decrease in cystine consumption (Figure 3—figure supplement 3D). Inhibition of mitochondrial fusion by Mfn2 knockdown slows proliferation by limiting aspartate synthesis. (A) Proliferation was assessed by using a CyQUANT assay after cells were treated with scrambled siRNA control (SSC) or Mfn2 siRNA for 72 hr (n = 5). (B) Mfn2 knockdown alters nutrient utilization (n = 4). Glutamine consumption decreases in Mfn2 knockdown cells, which is consistent with a decreased demand for glutamine to fuel a reduced level of OXPHOS. (C) Intracellular ATP levels in scrambled siRNA controls (SSC) were lower relative to Mfn2 knockdowns. ATP luminescence signals were normalized to protein amount (n = 5). (D) The intracellular pool of aspartate remained unchanged upon Mfn2 knockdown (n = 3). Pool sizes were normalized by dry cell mass and internal standard. (E) Scrambled siRNA controls excrete aspartate into the media, while Mfn2 knockdowns uptake aspartate from the media (n = 4). (F) Supplementing the media with 1 mM aspartate partially rescued the proliferation of Mfn2 knockdowns (n = 6). Data are presented as mean ±SEM. *p<0.05, **p<0.01, ***p<0.001, n.s. not statistically significant. Our results show that mitochondrial fusion supports a high level of OXPHOS, which is needed to sustain rapid cellular proliferation. We speculated that the decrease in proliferation rate upon Mfn2 knockdown might be due to a shortage of energy from the decreased rate of OXPHOS. Surprisingly, however, we found that intracellular levels of ATP actually increased slightly in Mfn2 knockdowns relative to scrambled siRNA control cells (Figure 3C). This result suggested that cells could compensate for a reduced energy yield from OXPHOS, but that OXPHOS may serve another indispensable function in our knockdowns. Previous studies have shown that an essential role of OXPHOS in proliferating cells is to regenerate reducing equivalents in support of aspartate synthesis (Birsoy et al., 2015; Sullivan et al., 2015). Through reactions in the malate-aspartate shuttle, increased oxygen consumption may support a higher rate of aspartate generation. Although we did not observe a difference in the intracellular pool of aspartate between scrambled siRNA controls and Mfn2 knockdowns (Figure 3D), we did find a striking change in aspartate uptake. While the control cells excreted aspartate, the Mfn2 knockdown cells consumed aspartate from the media (Figure 3E). Moreover, the proliferation of Mfn2 knockdowns could be partially rescued by supplementing cell-culture media with aspartate (Figure 3F). Although 3T3-L1 fibroblasts are immortalized, unlike transformed cells, they remain sensitive to contact inhibition and retain the ability to differentiate. To evaluate whether transformed cells similarly rely on OXPHOS and mitochondrial fusion, we generated stable transfected 3T3-L1 cells expressing the oncogene H-Ras (G12V), a constitutively active mutant (Figure 4A). H-Ras transfected fibroblasts assumed a transformed morphology and their growth was no longer contact inhibited, with high-density cultures forming multiple layers of cells (Figure 4B–C). It was confirmed that the transformed cells did not undergo oncogene-induced senescence (Figure 4—figure supplement 1). H-Ras transformed fibroblasts (Ras) have elongated mitochondria and increased OXPHOS that is supported by mitochondrial biogenesis. (A) Immunoblotting of whole-cell lysates shows H-Ras expression in transformed fibroblasts, but not in empty vector (EV) controls. (B) Growth curve shows the loss of contact inhibition in H-Ras transformed fibroblasts. The proliferation of EV controls remains cell-density dependent (n = 4). (C) Ras cells exhibit a morphological change and gain the ability to grow on top of each other to form multiple cell layers. (D) Mitochondrial stress test of EV controls and Ras cells (n = 3). The respiration of Ras cells is statistically increased compared to EV controls. (E) Measured and calculated parameters of mitochondrial respiration (using results from Figure 4D) (n = 3). (F) Statistical analysis of mitochondrial length in EV controls and Ras cells. In each condition, 100 random mitochondria were measured from EM images. Data are presented as mean ±SD. (G) RT-PCR shows that Ras cells have over a 20-fold increase in mRNA levels of PGC1α (n = 3). (H) Ras cells have increased mitochondrial mass, as indicated by an increased mtDNA/gDNA compared to EV controls (n = 3). (I) Immunoblotting of whole-cell lysates shows that Ras cells have higher expression levels of ETC subunits compared to EV controls. (J) Mfn2 knockdown decreases cellular proliferation in both EV controls and Ras cells. Proliferation was assessed by manual counting after cells were treated with scrambled siRNA control (SSC) or Mfn2 siRNA (Mfn2KD) for 72 hr. Relative proliferation was normalized to either an EV SSC or a RAS SSC for each condition (n = 4). (K) Mfn2 knockdown decreases cellular proliferation in H460 (lung cancer cells), HeLa (cervical cancer cells), BT549 (breast cancer cells), and MCF7 (breast cancer cells). Proliferation was assessed by using a CyQUANT proliferation assay after cells were treated with scrambled siRNA control (SSC) or Mfn2 siRNA (Mfn2KD) for 72 hr (n = 5). Unless specified, data are presented as mean ±SEM. *p<0.05, **p<0.01, ***p<0.001, n.s. not statistically significant. OCR, oxygen consumption rate; oligo, oligomycin; rot, rotenone; AA, Antimycin A. To study the effect of H-Ras transformation on mitochondrial metabolism, we compared the oxygen consumption rates of proliferating empty vector (EV) control cells in the exponential growth phase to H-Ras transformed (Ras) cells. Surprisingly, we found that Ras cells had a ~ 73% increase in basal respiration and a ~ 72% increase in ATP production compared to EV cells (Figure 4D–E). It is interesting to note that we found no difference in the mitochondrial coupling efficiencies between conditions (Figure 4E). This result is consistent with the observation that mitochondria are not further fused in Ras cells relative to proliferating EV controls (Figure 4F). Given that Ras cell mitochondria remain elongated to the same extent as EV controls, we next evaluated increased mitochondrial mass as a possible mechanism to support elevated levels of OXPHOS. For Ras cells, we observed a > 20-fold increase in the mRNA level of peroxisome proliferator activated receptor coactivator (PGC1α), a master regulator for mitochondrial biogenesis (LeBleu et al., 2014; Scarpulla, 2011) (Figure 4G). Ras cells had more mitochondrial mass and increased protein expression levels of ETC subunits (Figure 4H–I), suggesting that increased OXPHOS in Ras cells is driven by mitochondrial biogenesis. Activation of mitochondrial biogenesis upon Ras transformation did not change protein levels of components in the ERK/AMPK pathway or the KSR1 pathway, as has been previously suggested for other cells (Figure 4—figure supplement 2) (Dard et al., 2018; Weinberg et al., 2010). We wish to emphasize that even though Ras cell mitochondria are not further elongated, they remain fused to the same level as proliferating non-transformed fibroblasts. Therefore, when mitochondrial fusion was inhibited by knocking down Mfn2, the proliferation rates and OXPHOS of both EV cells and Ras cells were significantly attenuated (Figure 4J, Figure 4—figure supplement 3). In addition, the proliferation of various cancer cell lines also proved sensitive to Mfn2 knockdown (Figure 4K). We conclude that mitochondrial fusion is important to sustain cellular proliferation, independent of oncogenic transformation. We speculated that constitute activation of Ras might enhance metabolic phenotypes we associated with proliferation in non-transformed cells. Indeed, in addition to elevated OXPHOS, Ras cells consumed more glucose, glutamine, and fatty acids relative to EV controls (Figure 4—figure supplement 4A). 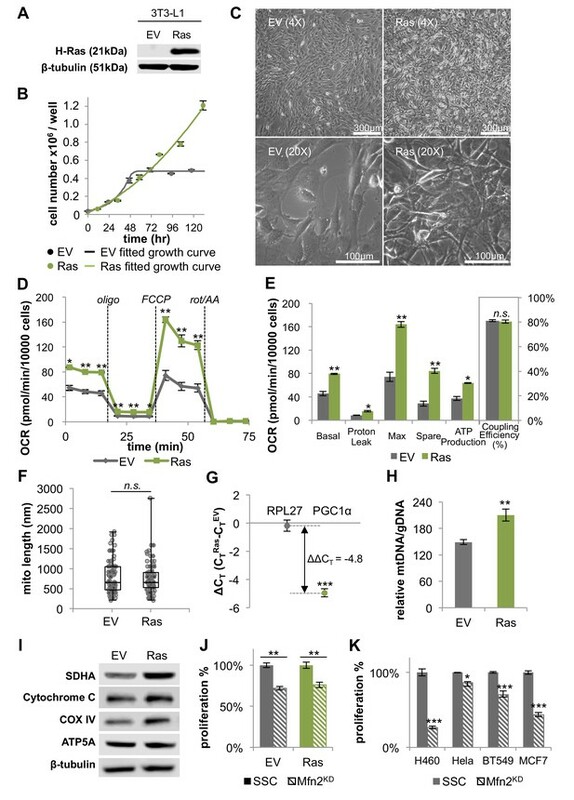 Given that Ras cells do not proliferate faster than EV cells (Figure 4B), the increase in metabolic activity is unlikely due to proliferative demand but rather associated with Ras signaling activation. Consistent with the notion that energy is not limiting during proliferation (Locasale and Cantley, 2011), we found that Ras cells had a higher intracellular level of ATP compared to EV controls (Figure 4—figure supplement 4B). In addition to increased ATP production, elevated OXPHOS activity in Ras cells also contributed to higher levels of reactive oxygen species (ROS) (Figure 4—figure supplement 4C). The associated oxidative stress could be buffered by treating Ras cells with the antioxidant N-acetyl cysteine (NAC). Alternatively, oxidative stress could be further induced by treating Ras cells with bromodeoxyuridine (BrdU), a thymidine analog (Figure 4—figure supplement 4C). We suspected that the elevated levels of ROS in Ras cells may lead to increased DNA damage. We verified this to be the case by showing that Ras cells had increased phosphorylation on histone H2A.X (Ser139), which has been suggested as a sensitive marker for DNA damage (Sharma et al., 2012) (Figure 4—figure supplement 4D). These findings suggest that the increase in OXPHOS upon constitutive Ras activation leads to elevated oxidative stress and DNA damage, while not directly contributing to the anabolic demands of proliferation. Given the pleiotropic effects of Ras and other oncogenes, the generality of these findings to additional cell types will require further investigation. Most proliferating cells assume a metabolic phenotype known as the Warburg effect (Lunt and Vander Heiden, 2011). Although the enhanced glycolytic characteristics of the Warburg effect are generally well established, metabolic changes associated with mitochondria have proven more challenging to interrogate. In part, this is because proliferation has largely been studied in the context of cancer where some experimental factors are complicated to control (e.g. tumor microenvironment, oxygen availability, genetics, proliferation, etc.). Here, we applied a well-controlled fibroblast model to quantify changes in mitochondrial respiration that occur in quiescent cells, non-transformed proliferating cells, and transformed proliferating cells. Strikingly, despite the frequent assumption that increased glycolysis in cells exhibiting the Warburg effect is associated with decreased OXPHOS, we found that mitochondrial respiration increased by nearly two-fold in non-transformed proliferating cells relative to quiescent cells. Moreover, mitochondrial respiration increased by nearly another factor of two when the cells were transformed with H-Ras. We wish to point out that the regulatory mechanism for increasing respiration between quiescent and non-transformed proliferating cells was different from that between non-transformed and transformed cells. The quiescent to proliferating transition was supported by mitochondrial fusion without any increase in mitochondrial mass, whereas the non-transformed to transformed transition was supported by mitochondrial biogenesis without any further increase in mitochondrial elongation. Similar increases in mitochondrial biogenesis and OXPHOS upon Ras activation have been reported in other cell lines (Funes et al., 2007; Moiseeva et al., 2009; Telang et al., 2007). In addition to Ras, various other signaling pathways that regulate cellular proliferation (e.g. c-Myc and mTOR) have also been found to activate mitochondrial biogenesis (Vyas et al., 2016). Notably, however, our data suggest that the proliferation rate of both non-transformed and transformed fibroblasts is dependent on mitochondrial fusion. It is interesting to consider why OXPHOS is increased by mitochondrial fusion in proliferating cells. Since ATP levels actually increased when OXPHOS was impaired by Mfn2 knockdown, mitochondrial fusion does not seem to be required to support energetic demands. Instead, increased respiration during proliferation seems to be needed to recycle reducing equivalents in support of aspartate synthesis. Only after mitochondrial fusion was inhibited did cells start consuming aspartate from the media. Moreover, proliferation could be partially restored in Mfn2 knockdowns by supplementing cell media with aspartate. Building on previous studies (Birsoy et al., 2015; Sullivan et al., 2015), these data suggest not only that respiration is required to meet aspartate demands, but that a high level of OXPHOS may be necessary to fulfill this role. On the other hand, too much OXPHOS may be detrimental to cells. Increasing OXPHOS beyond the level observed in non-transformed proliferating fibroblasts with the H-Ras oncogene did not increase the rate of proliferation. Instead, the considerably higher levels of OXPHOS induced by mitochondrial biogenesis resulted in oxidative stress and DNA damage. These results suggest that, unlike the mechanisms that increase mitochondrial respiration in normal proliferating cells, Ras activation may promote additional malignant transformations by creating genomic instability (Tubbs and Nussenzweig, 2017). Despite the association between the Warburg effect and rapid proliferation, a rationalization for the preference of glycolysis over OXPHOS has proven elusive (Liberti and Locasale, 2016). A challenge has been explaining how the switch to a metabolic program that is less energetically efficient supports the synthetic burden of cell replication. Transformation of glucose to lactate yields only two moles of ATP per mole of glucose, whereas complete oxidation of glucose by the TCA cycle yields ~ 32 moles of ATP per mole of glucose. Hypotheses have emerged that proliferating cells sacrifice ATP yield from glucose for other advantages such as a high rate of ATP production, decreased volume of enzymatic machinery, or increased concentrations of macromolecular precursors (Lunt and Vander Heiden, 2011; Slavov et al., 2014; Vazquez et al., 2010). Yet, to date, the benefits of using glycolysis over OXPHOS for proliferation have remained controversial. In this study, we provide evidence that the Warburg effect does not necessitate decreased OXPHOS. Rather, in the cells we examined here, glycolysis and OXPHOS are both elevated by significant levels during proliferation (Figure 5). Thus, the need to rationalize a preference for glycolysis over OXPHOS during proliferation may be unnecessary. Schematic representation of the metabolic differences between quiescent and proliferating fibroblasts. Compared to quiescent fibroblasts, proliferating cells increase both glycolysis and OXPHOS. The increase in OXPHOS is supported by mitochondrial fusion. 3T3-L1 cells were obtained from ATCC. H460, Hela, BT549, and MCF7 cells were obtained from Washington University. All cells were found to be negative for mycoplasma contamination. All cells were cultured in high-glucose DMEM (Life Technologies) containing 10% fetal bovine serum (FBS) (Life Technologies) and 1% penicillin/streptomycin (Life Technologies) at 37°C with 5% CO2. To establish a growth curve, cells were collected every 12–24 hr and counted in trypan blue with an automated cell counter (Nexcelom). For assessing proliferation, cells were grown under various experimental conditions for 48–72 hr, and proliferation was determined by manual cell counting or by using a CyQUANT proliferation assay (Thermo) according to the manufacturer’s instructions. For serum starvation, cells were cultured in DMEM (without FBS) for 48 hr. Proliferation was induced by transferring cells to media containing serum (20% FBS). The oxygen consumption rate (OCR) of whole cells was determined by using the Seahorse XFp Extracellular Flux Analyzer (Seahorse Bioscience). Cells were trypsinized and plated on a miniplate 24 hr prior to the Seahorse assay. For Mfn2 knockdowns, cells were treated with scrambled siRNA as a control or Mfn2 siRNA for 48 hr prior to seeding. The assay medium consisted of 25 mM glucose, 4 mM glutamine, 50 μM palmitate-BSA, and 50 μM oleate-BSA in Seahorse base medium. The OCR was monitored upon serial injections of oligomycin (oligo, 2 μM), FCCP (1 μM), and a rotenone/antimycin A mixture (rot/AA, 1 μM). A concentration of 1 μM FCCP was determined to be optimal in separate experiments. OCR was normalized to the final cell number or total protein amount as determined by manual cell counting or by using a BCA assay, respectively. Data presented have been corrected for non-mitochondrial respiration. 3T3-L1 fibroblasts were plated at ~20% confluence or 100% confluence to establish the proliferating or quiescent condition, respectively. EV controls and H-Ras transformed fibroblasts were plated at ~40% confluence. Then, 24 hr later, the medium was changed to medium in which natural-abundance glucose was replaced with U-13C glucose or natural-abundance glutamine was replaced with U-13C glutamine. For palmitate labeling, after 24 hr the medium was changed to medium containing 100 μM U-13C palmitate-BSA and 100 μM natural abundance oleate-BSA. After labeling for 6 hr, cells were harvested, extracted, and analyzed as previously described (Yao et al., 2018). The polar portion of the extract was separated by using a Luna aminopropyl column (Phenomenex) coupled to an Agilent 1260 capillary HPLC system. The Luna column was used with the following buffers and linear gradient: A = 95% water, 5% acetonitrile (ACN), 10 mM ammonium hydroxide, 10 mM ammonium acetate; B = 95% ACN, 5% water. Mass spectrometry detection was carried out on an Agilent 6540 or 6545 Q-TOF coupled with an ESI source operated in negative mode. The identity of each metabolite was confirmed by comparing retention times and MS/MS data with standard compounds. The isotopologue distribution pattern was calculated by normalizing the sum of all isotopologues to 100%. The labeling percentages of tracers at the end of the experiments are presented in Figure 1—source data 2. Data shown have been corrected for natural abundance and isotope impurity (see Figure 1—source data 3 for raw data). Pool sizes were calculated as the sum of all isotopologues and normalized to dry cell mass (measured by using an analytical balance) as well as a D8-phenylalanine internal standard. After incubating cells in fresh media for 24 hr, the spent media were collected and analyzed. Known concentrations of isotope-labeled internal standards (glucose, lactate, glutamine, glutamate, palmitate, and aspartic acid; Cambridge Isotopes) were spiked into media samples before extraction. Extraction was performed with glass as previously reported (Yao et al., 2016b). Samples were measured by LC/MS analysis, with the method described above. The absolute concentration of each compound was determined by calculating the ratio between the fully unlabeled peak from samples and the fully labeled peak from standards. The consumption rates (x) were normalized by cell growth over the experimental time period by using the following equation where N0 represents the starting cell number, t represents incubation time, DT represents doubling time, and Y represents nutrient utilization. DNA was extracted by using QuickExtract DNA extraction solution (Epicentre) according to the manufacturer’s instructions. The ratio of mitochondrial DNA (mtDNA) to genomic DNA (gDNA) was measured by using a NovaQUANT mouse mitochondrial to nuclear DNA ratio kit (Millipore) with RT-PCR (Applied Biosystems). We applied the following expressions: ΔCT = CTMitochondrial CTNucleic and mtDNA/gDNA = 2-ΔCT. For measuring PGC1α−1 expression levels, RNA was extracted using Trizol (Invitrogen). cDNA was synthesized using Super-Script III First-Strand Synthesis SuperMix (Invitrogen). Amplifications were run with RT-PCR by using premade primers (IDT). The results were normalized to a housekeeping gene, RPL27. The following expressions were applied: ΔΔCT = ΔCTPGC1α-1 – ΔCTRPL27 and fold change = 2-ΔΔCT. Mfn2 silencing was achieved by using a validated pool of siRNA duplexes directed against mouse Mfn2 (TriFECTa Kit, IDT) and Lipofectamine RNAiMAX Transfection Reagents (Invitrogen) according to the manufacturer's instructions (see Figure 3—source data 1 for the dicer-substrate short interfering RNA, DsiRNA, sequence). Cells given scrambled siRNA were used as a negative control. To rescue siRNA knockdowns, a siRNA-resistant cDNA that expresses wildtype Mfn2 was cloned in the pcDNA3.1+vector (GenScript) under a constitutive CMV promoter. The codon was optimized to be resistant to the siRNA added (see Figure 3—source data 1 for cDNA sequence). The control vector was pcDNA3.1+N eGFP (GenScript), which expresses GFP instead of Mfn2. For rescue experiments, cells were first knocked down with siRNA for 12 hr and then transfected with plasmids using Lipofectamine 3000 (Invitrogen) for 36–48 hr. For overexpression, wildtype cells were transfected with plasmids for 36–48 hr. Cells or isolated mitochondria were lysed with RIPA buffer (Thermo Fisher Scientific) in the presence of a protease inhibitor and a phosphatase inhibitor cocktail (Thermo Fisher Scientific). Lysates were separated by SDS–PAGE under reducing conditions, transferred to a nitrocellulose membrane, and analyzed by immunoblotting. For primary and secondary antibodies, please refer to the Key Resources Table. β-tubulin was used as a loading control. Signal was detected with a WesternSure premium chemiluminescent substrate and the C-Digit Blot Scanner (LI-COR) according to the manufacturer’s instructions. Samples were fixed in 2% paraformaldehyde/2.5% glutaraldehyde (Polysciences) in 100 mM sodium cacodylate buffer, pH 7.2 for 1 hr at room temperature. Samples were washed in sodium cacodylate buffer and postfixed in 1% osmium tetroxide (Polysciences) for 1 hr. Next, samples were rinsed in dH2O prior to en bloc staining with 1% aqueous uranyl acetate (Ted Pella) for 1 hr. Following several rinses in dH2O, samples were dehydrated in a graded series of ethanol and embedded in Eponate 12 resin (Ted Pella). Sections of 95 nm were cut with a Leica Ultracut UCT ultramicrotome (Leica Microsystems), stained with uranyl acetate and lead citrate, and viewed on a JEOL 1200 EX transmission electron microscope (JEOL USA) equipped with an AMT eight megapixel digital camera and AMT Image Capture Engine V602 software (Advanced Microscopy Techniques). The length of 100 random mitochondria for each condition were measured and plotted. After removing the media, cells were incubated with 100 nM MitoTracker Red CMXRos (Thermo Fisher Scientific) dissolved in complete medium at 37°C for 30 min. Nuclei were stained with Hoechst 33342 (Thermo Fisher Scientific). Cells were imaged alive using a Zeiss LSM 880 confocal microscope equipped with Airyscan. Images were acquired with a Zeiss 20x, 40x, 63x/1.4 NA objective by using the ZEN Black acquisition software. Samples were excited with 405 and 543 nm laser lines. Images were processed and prepared with the ZEN Black software. To generate lentivirus carrying oncogenic Ras (HRASV12), HEK293T cells were co-transfected with pCMV-VSV-G (a gift from Bob Weinberg; Addgene plasmid # 8454), pCMVΔR8.2 (a gift from Didier Trono; Addgene plasmid # 12263), and pLVX-HRasV12-hygromycin (a gift from David Piwnica-Worms) constructs with Lipofectamine 2000 reagent (Invitrogen). Cell media were replaced with fresh growth media 24 hr after transfection. Supernatants with lentivirus were collected after a 24-hr incubation period. Collected lentivirus (5 mL) was used to infect 106 3T3-L1 fibroblast cells in the presence of 10 µg/ml protamine sulfate overnight for ~16 hr. Selection of HRASV12-expressing 3T3-L1 cells was achieved by 100 µg/ml hygromycin. Ras expression was verified by immunoblotting. Senescence was tested by using the β-galactosidase staining kit (Cell Signaling) according to the manufacturer’s instructions. Intracellular ATP was measured by using an ATP luminescence detection assay kit (Cayman) according to the manufacturer’s instructions. The signal was normalized by protein amount as determined by using a BCA assay (Pierce). Cells were treated with 5 mM N-acetyl cysteine (NAC) or 5-bromo-2’-deoxyuridine (BrdU) for 48 hr. Intracellular reactive oxygen species (ROS) were measured by using a DCFDA assay (Cayman) according to the manufacturer’s instructions. The signal was normalized by protein amount as determined by using a BCA assay (Pierce). Journal of Molecular Medicine 85:1301–1307. Biochimica Et Biophysica Acta (BBA) - Bioenergetics 1859:845–867. Molecular Biology of the Cell 13:4343–4354. Annual Review of Cell and Developmental Biology 27:441–464. Molecular and Cellular Biology 29:4495–4507. The International Journal of Biochemistry & Cell Biology 42:1744–1751. Biochimica Et Biophysica Acta (BBA) - Molecular Cell Research 1813:1269–1278. Frontiers in Cell and Developmental Biology 3:43. Methods in Molecular Biology 920:613–626. Biochimica Et Biophysica Acta (BBA) - Bioenergetics 1817:1833–1838. Biochemical and Biophysical Research Communications 313:459–465. Thank you for submitting your article "Mitochondrial Fusion Supports Increased Oxidative Phosphorylation during Cell Proliferation" for consideration by eLife. Your article has been reviewed by three peer reviewers, including Ralph DeBerardinis as the Reviewing Editor and Reviewer #1, and the evaluation has been overseen by a Reviewing Editor and Andrea Musacchio as the Senior Editor. This paper compares mitochondrial function and dynamics between proliferating and non-proliferating fibroblasts. The authors find that proliferation activates glycolysis and respiration concurrently. 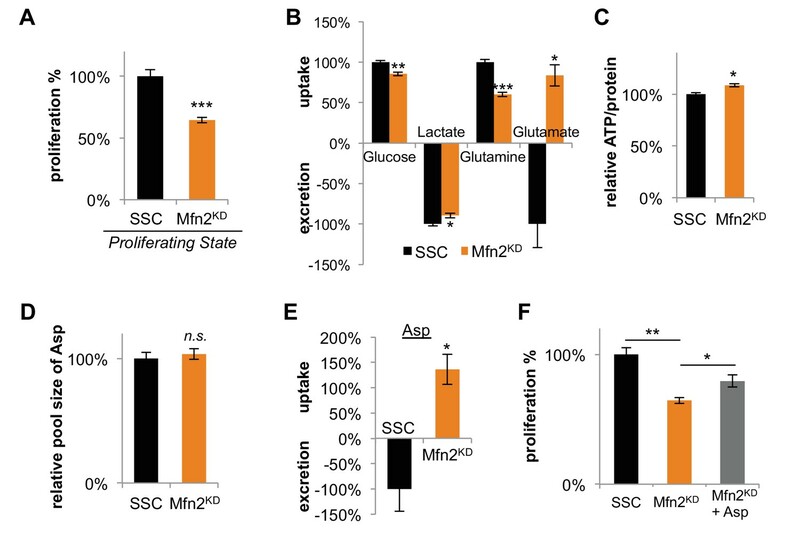 The gain in respiration is associated with enhanced glutamine-dependent labeling of TCA cycle intermediates and enhanced mitochondrial fusion and is reversed by silencing the fusion factor Mfn2. Blocking Mfn2 also reduces cell proliferation, and a compound reported to induce mitochondrial fusion modestly increases respiration. Expressing an oncogenic allele of HRAS induces both cell proliferation and respiration, with the latter effect being related to an increase in mitochondrial mass rather than a specific effect of fusion. The authors conclude that enhanced mitochondrial function, via mitochondrial fusion, supports fibroblast proliferation. Although some of these points have been made elsewhere in the literature, overall the paper provides a clear and convincing view of the metabolic transitions that accompany and enable mammalian cell proliferation, at least in this system. 1) Perhaps the most interesting question is how proliferating cells induce mitochondrial fusion. Can the authors provide an explanation for this switch, or at least better characterize how quickly this switch occurs when cells begin to proliferate? 2) One could argue that Mfn2 loss decreases OXPHOS overall rather than specifically preventing OXPHOS gain during cell proliferation. Can the authors show whether Mfn2 loss also decreases OXPHOS in quiescent cells? 3) Because the main readout of Mfn2 silencing is reduced proliferation (i.e. loss of fitness), the key experiments need to be controlled for off-target toxicity by re-expressing an siRNA-resistant cDNA of Mfn2. 4) The M1 experiment is important because it would indicate that mitochondrial fusion is sufficient to drive proliferation. But more data are needed. Does this dose enhance fusion in these cells? Does it cause metabolic changes consistent with enhanced fusion? Is the effect on cell proliferation dose-dependent? 5) Any insights into how HRAS induces PGC1α would improve the paper. The authors should also cite Weinberg et al. (2010) which first reported the role of oncogenic HRAS and KRAS on ROS and respiration. 6) Are some of these metabolic changes enabled by changes in membrane transporter expression? 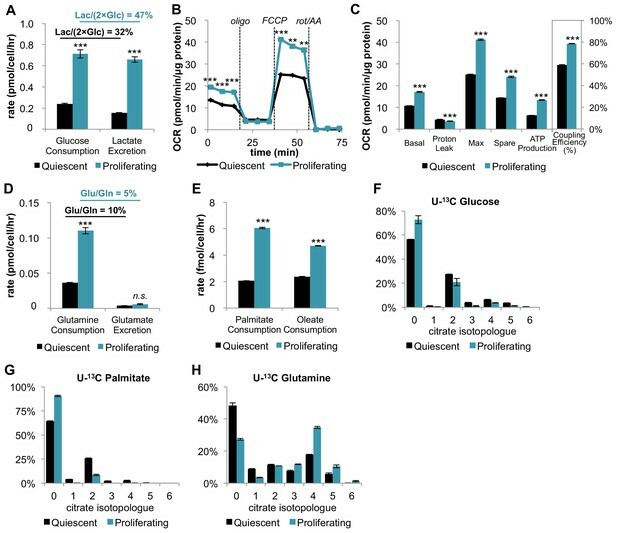 Assessing the levels of SLC7A11 (cystine-driven glutamine anaplerosis) and SLC1A2/3 (glutamate/aspartate uptake) in the quiescent and proliferating states with and without Mfn2 expression might help explain some of these changes. We have performed experiments to better understand how proliferating cells support mitochondrial fusion and to understand how quickly the switch occurs as cells begin to proliferate. Our results are consistent with mitochondrial fusion being supported by increased protein levels. The process occurs as fast as 3 hours after proliferation begins. We elaborate below. The mechanisms underlying mitochondrial dynamics remain incompletely understood (Salazar-Roa et al., 2017). However, emerging evidence indicates that mitochondrial fusion is regulated (at least in part) by protein levels. Specifically, it has been suggested that OPA1 is regulated by proteolysis and Mfn1 and Mfn2 by ubiquitin-mediated degradation (van der Bliek et al., 2013). Accordingly, we examined the protein levels of Mfn1, Mfn2, and OPA1 in our quiescent and proliferating fibroblasts. Indeed, we observed that mitochondria in proliferating cells have significantly higher levels of Mfn1, Mfn2, and OPA1 compared to mitochondria in quiescent cells. These data are now presented in Figure 2—figure supplement 2 of the revised manuscript. These data support that mitochondrial fusion involves increasing protein levels. To assess how quickly mitochondrial fusion begins after cells start to proliferate, we needed to switch models. Our contact-inhibition system is well suited to study the transition from proliferation to quiescence upon contact inhibition at 100% confluence. It is not possible, however, to study the reverse transition from quiescence to proliferation by using contact inhibition. As such, to address the reviewers’ question, we established quiescence in 3T3 fibroblasts by serum starvation. We then induced proliferation by re-introducing serum and quantified mitochondrial elongation at three different time points (3 hours, 16 hours, and 30 hours). 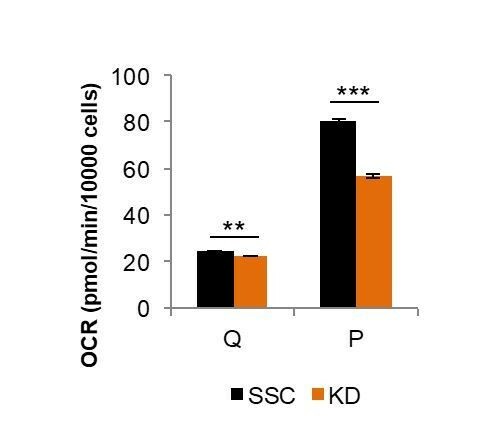 As expected, we observed that serum-starved quiescent cells have significantly shorter mitochondria. Notably, in as fast as 3 hours after serum was reintroduced to induce proliferation, there was a statistically significant increase in mitochondrial length. Mitochondrial length continued to increase with time. These data were added as Figure 2—figure supplement 5B. We agree with this suggestion and performed the recommended experiment. Knocking down Mfn2 in quiescent cells led to only a minimal decrease in OXPHOS (~5%) compared to the substantial decrease in OXPHOS we observed upon knocking down Mfn2 in proliferating cells (~30%) (Author response image 1). Comparison of Mfn2 knockdown on basal respiration in quiescent (Q) and proliferating (P) fibroblasts. Loss of Mfn2 had only minimal effects on oxygen consumption rate (OCR) in quiescent cells but had a substantial impact on proliferating cells. This plot is derived from data shown in Figure 2E and Figure 2—figure supplement 4, but is not included in the revised manuscript directly. Since mitochondria in quiescent fibroblasts are already extensively fragmented (Figure 2D), we predicted that loss of Mfn2 would have little to no effect on OXPHOS. When we measured the oxygen consumption rates of scrambled siRNA controls (SSC) and Mfn2 knockdowns in the quiescent state, we found only a small difference. This contrasts to the substantial differences observed for proliferating cells (Figure 2E-F). These new data, which support that Mfn2 loss prevents gain of OXPHOS during proliferation rather than merely decreasing OXPHOS overall, are presented in Figure 2—figure supplement 4 of the revised manuscript. As the reviewers suggested, we constructed a codon-modified cDNA that expresses wildtype Mfn2 but is resistant to the siRNA added (please see source file for sequences for siRNA and siRNA-resistant Mfn2). Expression of this siRNA-resistant Mfn2 (Mfn2res) in Mfn2 knockdowns restored Mfn2 protein level, mitochondrial respiration, and cellular proliferation. These data, which control for off-target toxicity, are presented in Figure 3—figure supplement 1 of the revised manuscript. We agree with the reviewers that it is important to test whether increased mitochondrial fusion is sufficient to drive proliferation. In the original manuscript, we attempted to increase mitochondrial fusion pharmacologically with a drug known as M1. The reviewers suggested that we perform three M1-related experiments: (i) dose-response analysis for M1, (ii) quantify change in mitochondria length after M1 treatment, and (iii) analyze metabolic changes due to M1 treatment. We did these experiments but determined that M1 was not the best approach to test our predictions. Instead of using a drug to increase mitochondrial fusion, we found it to be more effective to overexpress Mfn2 in our wildtype 3T3 fibroblasts. As mentioned in response to point 1 above, previous studies have suggested that mitochondrial dynamics may be regulated by protein levels. Increasing levels of Mfn2 protein in fibroblasts increased mitochondrial respiration and cellular proliferation. Our results support that increased fusion is sufficient to drive proliferation. First, we performed the three suggested experiments related to M1. Since we decided to remove M1 from the study (specifically Figure 3A in the original manuscript), we did not include these data in the revised manuscript. We used EM imaging on DMSO controls and cells treated with M1. We did not observe a statistically significant difference between controls and M1-treated cells. Similarly, we did not observe a statistically significant difference in respiration between control cells and M1-treated cells. Based on these data, M1 treatment did not induce enough mitochondrial fusion in our system to test whether an increase in mitochondrial fusion is sufficient to drive proliferation with the M1 drug. As an alternative strategy to test this prediction, we overexpressed wildtype Mfn2 (Mfn2res) in wildtype 3T3 fibroblasts. The overexpression resulted in a ~2-fold increase in protein level from whole-cell lysate (Figure 3—figure supplement 2A). The increase in protein led to a significant increase in mitochondrial respiration (Figure 3—figure supplement 2B) and a significant increase in proliferation rate (Figure 3—figure supplement 2C). These data are presented in Figure 3—figure supplement 2 of the revised manuscript. We thank the reviewers for providing this reference, which we now cite. In terms of how HRAS induces PGC1α, the exact signaling cascade is not well defined (Dard et al., 2018). To the best of our knowledge, two pathways have been suggested as a potential link: the ERK/AMPK pathway (López-Cotarelo et al., 2015; Weinberg et al., 2010) and the KSR1 pathway (Fisher et al., 2011). Based on these previous studies, we analyzed the expression levels and phosphorylation levels of ERK, AMPK, and KSR1. Phosphorylated AMPK and phosphorylated KSR1 were not detected. AMPK and KSR1 were not changed between empty vector controls (EV) and Ras transformed fibroblasts (Ras). We also did not observe any difference in Erk1/2 and phospho-Erk1/2 levels. These data are presented in Figure 4—figure supplement 2. They suggest that the mechanism for how Ras induces PGC1α in our fibroblast system may not involve a change in the ERK/AMPK or KSR1 pathways as has been suggested for other cells. The metabolic changes that we observe do not seem to be enabled by changes in expression of the SLC7A11 or SLC1A2/3 membrane transporters between proliferating and quiescent cells. Consistent with this idea, however, we did find that cystine uptake was elevated by over 2-fold in wildtype proliferating cells compared to wildtype quiescent cells. In contrast, when Mfn2 was knocked down, cystine uptake was decreased by ~40%. Thus, while the observed metabolic changes may not be enabled by differential expression of membrane transporters, they do seem to be enabled by differential activity of the transporters. We first analyzed the protein level of the cystine/glutamate transporter, SLC7A11, in quiescent and proliferating fibroblasts, with and without Mfn2 expression. We did not observe any differences in protein expression. In the revised manuscript, these data are shown in Figure 1—figure supplement 2A and Figure 3—figure supplement 3D. We combine the data here for convenience in Author response image 2. Immunoblot of SLC7A11 from whole-cell lysates for scrambled siRNA control cells in the quiescent state (SSC_Q), siRNA control cells in the proliferating state (SSC_P), Mfn2 knockdown cells in the quiescent state (Mfn2KD_Q), and Mfn2 knockdown cells in the proliferating state (Mfn2KD_P). To test whether the metabolic changes observed could be enabled by changes in transporter activity (independent of expression level), we evaluated the consumption rate of cystine. Strikingly, we found that cystine uptake was elevated by over two-fold in proliferating fibroblasts compared to quiescent fibroblasts. In contrast, when Mfn2 was knocked down, cystine uptake decreased by ~40%. These data were added as Figure 1—figure supplement 2 and Figure 3—figure supplement 3D. As the reviewers suggested, we also assessed the protein levels of the glutamate/aspartate transporter SLC1A2/3 (Excitatory Amino Acid Transporter, EAAT2/1). In addition, we assessed the protein level of another glutamate/aspartate transporter SLC1A1 (EAAT3). Proliferation did not affect the protein expression of any of these transporters, while Mfn2 knockdown seemed to decrease the expression of SLC1A3 but not SLC1A1/2 (see Author response image 3). Since these transporters can carry amino acids in either direction (i.e., in or out of a cell), it is difficult to interpret whether this change in transporter expression is the cause of the change in uptake or excretion rates observed in Figure 3B,3E. Immunoblot of SLC1A1/2/3 transporters from whole-cell lysates for scrambled siRNA control cells in the quiescent state (SSC_Q), siRNA control cells in the proliferating state (SSC_P), Mfn2 knockdown cells in the quiescent state (Mfn2KD_Q), and Mfn2 knockdown cells in the proliferating state (Mfn2KD_P). GJP is a scientific advisory board member for Cambridge Isotope Laboratories and a recipient of the Agilent Early Career Professor Award. We thank Wandy Beatty and the Molecular Microbiology Core at Washington University for their support in imaging cells and mitochondria. We thank Gao-Yuan Liu for his discussion in experimental design. We thank Xiangfeng Niu for preparing the mitochondrial isolation solution. © 2019, Yao et al.